Early morning in my house is typical of most homes with kids. In a word chaotic! However, the family know that at 07h15 mom sits down with coffee to watch the Expresso show cooking slot. So they had best be quiet, especially when the cooking involves fish or seafood! Last week Franck Dangereux from the Foodbarn restaurant made his lentil and fish dish which I thought was such an interesting combination that I had to try it and share it with you. The recipe calls for a line fish, but I’m using Gurnard as I feel it is underrated by many. When cooked, it has a lovely firm flaky texture, is white in colour, and appetising in appearance. Gurnard is caught by inshore and offshore trawl, the latter being more sustainable as there is less bycatch. Offshore trawled Gurnard is on the green list, while inshore trawled is on the orange list according to the SASSI guide. 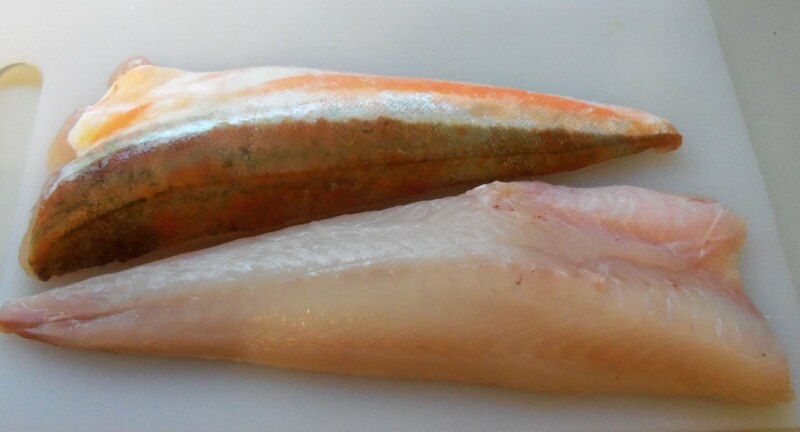 Fresh Gurnard has a fresh ocean smell, the flesh is translucent white and resilient. The skin of the Gurnard is a bright orange/reddish brown and white. I always suggest choosing your Gurnard with the skin on, as the brightness of the colour in the skin is the best indicator of whether the fish is fresh. In a pot, place the lentils, thyme, Shiraz, and water (do not add any salt at this stage). Cover and bring to the boil, then remove the lid and allow to cook gently until all the liquid has evaporated. When the liquid has evaporate, stir in the butter, and season with salt and pepper, then set aside and keep warm. For the sauce, heat a little oil in a pan, and sauté the garlic gently (do not brown) for 2 minutes. Use the lemon juice to deglaze, scraping any bits from the bottom of the pan, and add the cream. Cook until the sauce coats the back of a spoon, then add the parsley. Season with salt and pepper to taste, and pour into a small saucepan. Pour a drizzle of olive oil into a very hot non-stick pan, and fry the fish for 2 minutes on high heat. Turn the fish over and cook for a further minute. The cooking time will depend on the thickness of the fish. 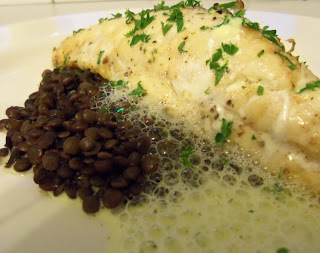 To assemble, spoon lentils onto hot plates, and arrange 3 garlic cloves around the lentils. Top with the line fish. Re-heat the sauce briefly and liquidise in the pot with a hand blender until slightly frothy. Ladle the sauce around the lentils and serve.